Michael Stone – The gift of our wounds from Ian MacKenzie on Vimeo. “What if,” asks Michael Stone in this new video teaching, “somebody who suffered from an eating disorder, or someone who suffered from depression, or someone who suffers from anxiety, recognizes that the way they work with their anxiety, the way their practices help them overcome depression — what if they see that that process of working with their woundedness actually gives them real tools to take positive and creative action in the world? “When you see an image of Guanyin, when you see an image of Kannon, when you see a sculpture of the Bodhisattva, she has a thousand arms. And in every arm, in every hand, there is a different tool. One arm might have a rake, one arm might have a rope, one arm might have an image of an awakened Buddha, one arm might have an iPhone, one arm might have another app. And these thousands of arms have different kinds of tools. And it’s said that if you want to really put love in action or compassion into action, you need many kinds of tools. 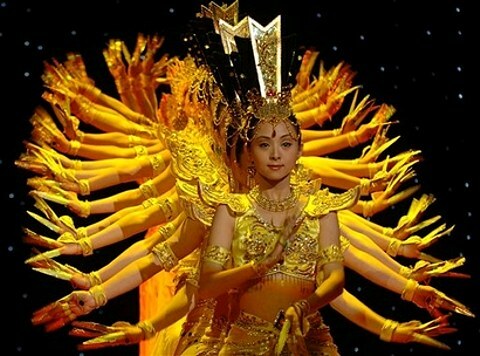 So when you go to temples where the centerpiece of the temple is a Bodhisattva, or is Guanyin, or a Kannon, you see an image of a woman or a man with a thousand arms. I think about this in my life: what does it mean to have tools of compassion? It seems, in my life, having tools of compassion has everything to do with my own woundedness. To be able to take places where I’ve been wounded and recognize that instead of seeing those wounds or those scars as kind of places that hold me back or stop me, maybe my woundedness is also a tool for connecting with others. What if I can use the ways that I’ve been scarred? What if we can use the ways that we’ve been wounded? As the springboard for action? What if our wounds are actually tools. What if somebody who suffered from an eating disorder, or someone who suffered from depression, or someone who suffers from anxiety, recognizes that the way they work with their anxiety, the way their practices help them overcome depression — what if they see that that process of working with their woundedness actually gives them real tools to take positive and creative action in the world? In a way, this is what the Bodhisattva represents with all her arms, and with every hand, in all her different tools: is taking the places we’ve been wounded and using those wounds to become real tools for real action. That’s how it works at an individual level. We all know that when we’re wounded, if we see our wounds as positive, it allows us to connect with others who have the same wounds. Michael Stone leader of Centre of Gravity, is a psychotherapist, Yoga teacher, author and activist, committed to the integration of traditional teachings with contemporary psychological and philosophical understanding. The components of his practice include Yoga postures, breathing technique, meditation and textual study. Over the years, his goal has been to cultivate long-term relationships with people who want to deepen their understanding of Yoga and Buddhist teachings and practice. He also maintains a dedicated workshop and retreat schedule in communities in Canada and abroad. Michael is a father and lives in Toronto with his partner Carina Lof and his 9 year old son Arlyn. These days you can find him working on a documentary film called “Reactor,” a new book of the same title, teaching, and also giving talks at conferences and in community. Thanks to Michael and to Ian MacKenzie, who shot and edited this video, for sharing. You’ll find more from Michael on SunSpace here. And for more on the work of the bodhisattva, see Pema Chodron’s “A Greater Happiness,” from our current issue.